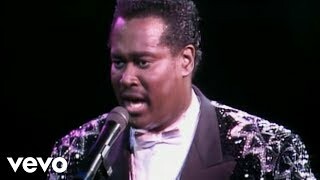 A suave crossover balladeer and meticulous pop craftsman whose impeccable phrasing, delicate articulation and romantic delivery were underscored by his extra–ordinary hitmaking talents as a songwriter, producer and arranger, Luther Vandross (1951-2005) was by every account THE most beloved R&B male vocalist of his generation. With a cumulative 20 gold, platinum and multi-platinum certifications in the U.S. alone (singles, albums, videos) and worldwide sales of more than 30 million albums, Luther’s impact on popular tastes has been second to none. The multi-platinum, 8-time Grammy Award-winning career of this singer’s singer and musician’s musician is commemorated on LOVE, LUTHER – the first box set in his name. The 56-track, deluxe display-book package of four CDs, boasting the lion’s share of his 27 years of R&B/pop crossover chart titles – plus album tracks, live versions from long-form videos, rarities (including background session vocals and contributions with Aretha Franklin, Gregg Diamond, and Change), duets with Frank Sinatra, Mariah Carey, Beyoncé, Dionne Warwick, Cheryl Lynn, and Gregory Hines, and six previously unreleased tracks. * 56 stunning songs on 4 CDs — over 4 hours of music! Pre-order now @ Sony Music Store!